Whether the water in your home comes from a municipal system or a well in your backyard, it’s not easy to tell what you’re getting. If your water is cloudy or has a strong smell, you might be suspicious but a lot of contaminants are odorless and colorless. Don’t even know they’re there. 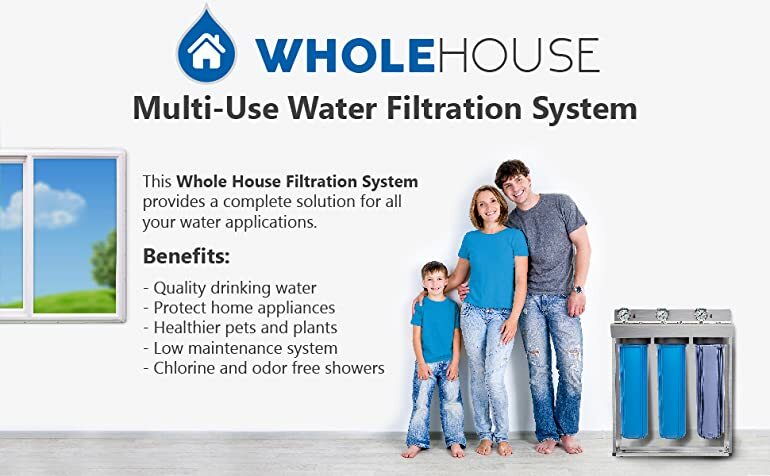 The easiest way to make sure the water that you’re using every day is free of chemicals and other contaminants is to install the best whole house water filtration system. It takes care of all the water entering your home so whether you’re drinking it or giving your baby a bath, you can trust the water is safe. 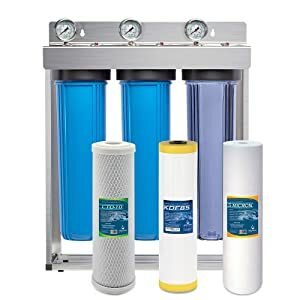 How to Install Whole House Water Filtration System? 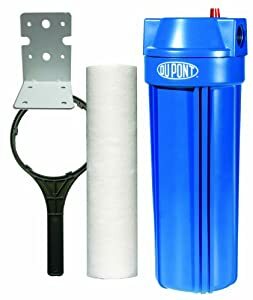 How to Replace Whole House Water Filter? There are a lot of different whole house systems to pick from. We put together this list of the best options out there so you can see them all side-by-side and decide which one is the best one for you. This filtration system from iSpring features an effective 2-stage filter. The first consists of high-capacity polypropylene the removes dirt and sediment. Stage 2 is made of coconut shell carbon that pulls out impurities, chemicals, cloudiness, and bad odors. Both filters have a capacity for 100,000 gallons which is enough to last a family of 4 for up to a year. Hiring a professional for installation is not required but you do have to have a bit of plumbing knowledge to do it yourself. 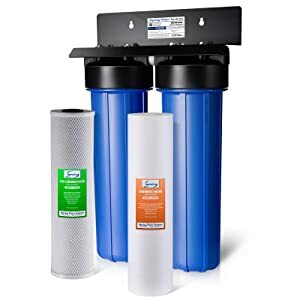 The 2-stage filtration uses 5-micron filters to remove sediment, chlorine, rust, pesticides, herbicides, and more without eliminating any healthy minerals. This filter causes minimal water pressure reduction. iSpring provides great customer service if anything goes wrong. This product is covered with a 1-year warranty. Leaks between the 2 filters occasionally occur. They’re difficult to repair because you can’t get to the source of the leak without removing the entire system. This filtration system is only meant for lightly contaminated municipal water and won’t be effective against highly chlorinated water or well water. The Home Master HMF2SDGC has oversized filters to improve flow rate and so the filters last as long as possible with little to no maintenance. Installation is generally pretty easy and it’s covered by a 2-year warranty. The first stage of filtration uses a multi-gradient filter that goes from 25 microns down to 1. While the second stage of activated coconut shell carbon removes chlorine and other chemicals as well as any odors. The 2-stage filter removes up to 95% of sediment, chlorine, and other contaminants that cause bad tastes and odors. This filter will last a family of 4 up to 1 year. Thanks to the oversized filters, ports, and housing, your water pressure won’t be significantly reduced. The stage 1 filter uses multi-level filtration ranging from 25 microns all the way down to 1 to eliminate even the most resistant bacteria and chemicals from the water. Installation is pretty easy and a lot of what you need is included, like a steel mounting bracket, bolts, and a housing wrench. Port threads are plastic, not metal, and aren’t as durable as they could be. There are 3 stages to this system from Express Water: a sediment filter, granular activated carbon, and an activated carbon block. They work together to remove rust, lead, chlorine, pesticides, cloudiness, odors, and a whole lot more from the water in your home. Each of the 3 stages has a pressure gauge to monitor the system and a pressure release valve in case you need it. This system is also covered by a 1-year warranty and lifetime technical support. The housing for the first stage of filtration is clear so you can see into your system to see when you need to change the filters without disrupting anything. Swapping in new filters is quick and easy because of the twist off housings and drop-in design. 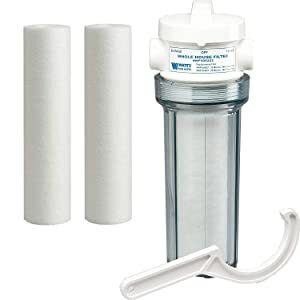 These filters can last up to 12 months with typical use depending on the quality of your water. Large connections cause almost no change in water pressure and the system delivers up to ¼ gallon per second. The system comes fitted to a freestanding stainless steel frame so it can be freestanding or wall-mounted. Water pressure gauges are not always accurate. The filtration system from 3M has an easy to use quick-change filter cartridge and an exceptionally high flow rate of 20 GPM. This one stage filter uses carbon media to reduce chlorine taste and odor and feature a corrosion resistant stainless steel head. This system also includes a 25-year limited warranty. Stainless steel head won’t corrode and is covered by an industry leading 25-year limited warranty. The flow rate is an impressive 20 GPM. Cartridges simply twist into place with no tools required. Each filter cartridge filters 100,000 gallons of water and lasts about a year. While this filter will separate sediment, dirt, and rust in addition to chlorine taste and odor, 3M does recommend using an additional pre-filter system as a pre-filter to separate larger pieces of debris. Depending on your water quality, you may need to purchase a second type of filter to achieve the best results. Water flow can slow down over time as lime and other contaminants build up. While this single stage filtration system from DuPont works great on its own, the best thing about it is its versatility. It’s compatible with most other brands or whole house water filters and so affordable that it’s pretty easy to create your own multi-step system. This allows you to tailor the filtration specially to what you need. Because this system is compatible with most brands of filters, it’s really easy to upgrade from the basic filter that is included. This product is so affordable and easy to use, you can create your own multi-stage system by placing 2 or 3 of them inline. Being able to essentially build your own multi-stage filtration system lets you choose exactly the kind of filters you need for your water. It’s covered by a 3-year limited warranty. Each of the included filters only treats 15,000 gallons which means you’ll have to replace them pretty frequently unless you choose a filter from a different brand. You will need to do some upgrades to make this system perform as well as comparable products. Another great whole house water filtration system is the Watts WH-LD. 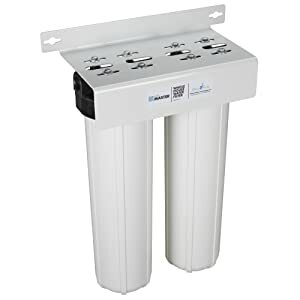 The 50-micron filter is ideal for reducing sediment, dirt, rust, and suspended particles and is easy to connect to standard household plumbing. Clear housing lets you see when a filter change is necessary and it’s covered with a 1-year warranty. The built-in bypass valve makes it easy to access the unit without having to shut off the water main when it’s time for filter changes. Just switch from “use” to “off” and you’re ready to go. This package includes 3 filters and replacements are inexpensive. Installation requires some plumbing knowledge but there are technical support staff on call if you need help during the process. Clear housing lets you see when it’s time for a filter change and get a good idea of how much the filter is actually removing from your water. Most users report that it does not noticeably reduce water pressure. Filters need to be changed approximately every 3 months or sooner depending on the quality of your water. You may need to hire a professional plumber for installation. 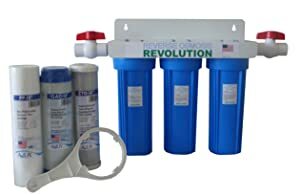 This 3 stage system from Reverse Osmosis Revolution uses, you guessed it. Reverse osmosis to separate chlorine, radon, and volatile organic compounds from the water as well as cloudiness, colors, and bad tastes and smells. Filters need to be changed about every 3 months and an extra set is included and it comes with a 1-year warranty. There are 3 different stages of filtration: a 5-micron filter to remove sediment, a granular carbon filter for chemicals, and a carbon block filter that removes everything from pesticides to industrial solvents. A clear housing means you can easily see when it’s time to change the filter. An extra set of 3 filters is included and replacements are reasonably priced. Installation is easy and the included instructions are very helpful. Filters only last for about 3 months of 6,500 to 8,000 gallons depending on the quality of your water. This system can cause a noticeable drop in water pressure as it filters as 10 GPM. Leaks have been reported by some users. 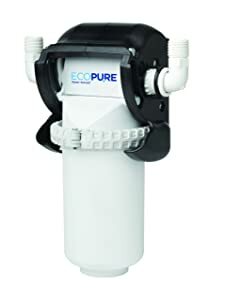 The EcoPure system uses a 5-micron filter to eliminate chlorine taste and odor, dirt, rust, and sand. It features an automatic bypass valve and encapsulated filter design so changing filters is quick and easy and as mess-free as possible. Installation is also pretty simple and it includes a limited 2-year warranty. The encased filtration system, bypass valve, and pivoting design make filter changes fast and easy. It uses patented Flow and Capture Technology to deliver clean, filtered water without affecting the water pressure in your home. Filters last for about 6 months with regular use. Installation is easy and adaptors, clips, and tubing are included along with easy-to-understand installation instructions. Replacement filters are a little costly compared to other brands and, depending on the kind of water you have in your home, you might need to replace the filters more frequently than recommended. This system only uses 1 stage of filtration and may not be able to clear everything from water that is particularly high in chlorine and other chemical elements. The best whole house filtration system is the iSpring WGB22B Whole House Water Filtration System. It features a 2-stage filtration system that consists of a high-capacity polypropylene filter to remove dirt and sediment and a second stage made of coconut shell carbon to eliminate other impurities. Both filters have a 100,000-gallon capacity and can last a family of 4 up to a year, a much longer time than some of the other options available that only last from 3 to 4 months. Maintenance is minimal and the filter causes minimal change in water pressure. Installation isn’t terribly complicated but it’s recommended that you hire a professional if you don’t have at least a general knowledge of plumbing. As you can see, not all of these systems are the same. There are a few things to keep in mind when deciding which is the right system for your home. Water flow, or flow rate, is measured in gallons per minute (GPM) and tells you how much water is coming through the filter. To determine what flow rate you need for your home, you have to determine how much water you use. Consider all the alliances and other things in your home that use water: shower, toilet, sink, dishwasher, hot water heater, etc. Most of these should have demand ratings printed on them somewhere. For example, most showerheads are about 2.4 to 5 GPM while more toilets are about 1.5 gallons per flush. Obviously, the more people in your home, the more the water flow you need. If you live alone, you’re probably not running the dishwasher every day and are only flushing the toilet a handful of times. If you have a family of 5, obviously the demand is greater. So, the interesting thing about these systems is that it doesn’t matter how large your home is. What matters more is how many people are living in it. How many GPM do I need? A single person living alone with average water use can probably get by with a filtration system with a flow of 15 GPM while a large family can require as many as 40 GPM. These are good estimates to make sure that everything has optimal water pressure during peak use. Also, keep in mind that anything below 10 GPM isn’t good enough. Water pressure will be too low when more than one thing is being used at a time. For example, if you only have 10 GPM flow and water to shower while the dishwasher is running, you may not be able to do so. There are some things to consider that rely on the kind of water you have in your home. Here are some examples. If you have well water, it’s a good idea to get some protection against contaminants that you wouldn’t have to worry about if you were connected to a municipal system that ran through a treatment plant. One of the things to think about if you have well water is the kind of contaminants you might be dealing with. There are a lot of options when it comes to filtering media and stages of filtration with these systems that can help you remove specific contaminants. The best thing you can do is to have your water tested. You should do this every year to see what is contaminating your water. These tests find things like pesticides, chemicals, volatile organic chemicals, viruses, and bacteria. Once you know exactly what you’re dealing with you can choose a filter that can help you get rid of those specific things. A lot of this depends on where you live and the things that occur naturally in different areas. Not every well is the same. City water is supposed to meet certain criteria and usually passes through treatment plants and undergoes regular testing so it’s a little more trustworthy than well water. That said, there are things to be concerned about in a municipal water system, like aluminum, lead, mercury, radium, and barium. Bacteria and viruses can also be a problem. Most city water is treated with chlorine to combat these things and prevent diseases like cholera and typhoid. This is completely necessary but it can make your drinking water smell and taste bad. Installing a whole house filtration system can eliminate everything from lead to bad smells and cloudiness. Again, it’s a good idea to have your water tested so you know what you’re dealing with to help you choose the filter that best fits your home. Hard water is water that has a high content of limestone and chalk. While it’s not necessarily harmful to drink, showering with it can lead to irritation if you have dry skin. It also causes sediment to build up in your plumbing one fixtures that can lead to a drop in water pressure. Water softeners work by reducing these elements with sodium. While it eliminates the problems that hard water causes, it leads to problems of its own. The softened water feels almost slimy and can leave behind a lot of films. Softening hard water doesn’t eliminate the contaminant that was causing the problem in the first place, it just replaces it with something else. If you have hard water, a whole house water filtration system is a great solution. Physical filtration. This stage separates out some of the larger particles and is measured in microns. In the products we looked at, they vary from 50 microns all the way down to 1. The smaller the number of microns, the smaller the particles the filter can remove. So, a 50-micron filter is designed to remove larger pieces of debris and rust while a 1-micron filter removes the things that you can’t see, like bacteria and viruses. Carbon Filtration. Carbon filtration is often used in 2 different stages in systems that use 3 altogether. It’s used in both granular forms and as a large block. Carbon filtration removes chemicals and cloudiness as well as bad smells and tastes from the water. This is why we emphasized having your water tested to see what kind of filtration you need. The more contaminants you have, the more stages of filtration you should use. Installation isn’t too complicated and, for most of these products, you can do it yourself if you have some plumbing knowledge and the proper tools. That said, if you don’t feel completely comfortable, you should definitely hire a professional. Maintenance is pretty easy with these systems. Check the filters regularly and change them as needed. That’s pretty much all you need to do. If you forget, you’ll soon realize it because your water will revert back to its unfiltered state and you may notice a change in water pressure. A whole house water filtration system the best way to make sure that all of the water in your home is contaminant free. It eliminates the need for separate drinking water filtration and helps all of your appliances run better. Another great thing about it is how much it can help people who have sensitive skin. If you have dry, itchy skin after you shower and aren’t sure why it might be something in the water that’s causing it. A whole hour filtration system eliminates this problem. The key to these systems being so effective is where they’re installed – right where the water enters your home. That means that the very first thing that happens to water traveling through your pipes is it goes through the filter. From there, it travels throughout your home, clean and clear. 1. Drain the system. First, turn off the main water supply. Then, place a bucket under the lowest faucet in the house and open it to empty out what remains in the pipes. 2. Select the location for your filter. It should be as close to the entry point as possible and before the water enters a heater. You will need regular access to change filters so make sure it’s in a place where you can easily get to it. 3. Cut out a section of pipe, placing a bucket underneath to catch any remaining water. The installation instructions included with your system should tell you exactly how large a section to cut. 4. Attach the fittings. Sometimes these are included but they often are not. 5. Position the filter, making sure that the intake side is connected to the incoming pipe and the output side is connected to the pipe that goes into your home. Tighten the fittings. 6. Turn on the water. Installation is generally not difficult but if you don’t feel comfortable with plumbing, hire a professional. If you don’t cut the pipe correctly, it could be costly to have repaired. Filters are generally easy to change. Most of these systems are designed with a simple twist and drop in the system. If your system does not have a bypass valve, you will need to turn off the water main and have a bucket handy to catch what’s left. If you do have a bypass valve, just turn the water off temporarily. Basically, all you have to do it open the canister, remove the old filter and place a new one. Then, either switch the bypass valve to the “on” position or turn the water main back on. The best way to make sure that all the water you use in your home is clean, clear, and safe from contaminants is to use a whole house water filtration system. One time installation is generally pretty easy and the only maintenance is checking and changing filters periodically. Whether you have hard water, well water, or water that comes into your home from a municipal system, you want to make sure it’s of the highest quality possible. These systems are the absolute best way to do that.